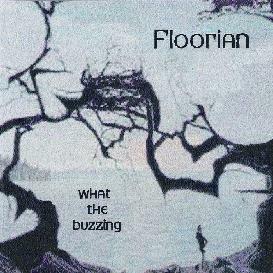 Floorian - "What the Buzzing"
I enjoyed the original release of Floorian’s What the Buzzing CD. Though I have to admit, unlike our esteemed editor here at AI, I wasn’t totally floored by it. But when Jerry asked if I’d like to review the new re-release of What the Buzzing, I said "What the... heck." Sure, why not? It would give me a chance to revisit it. I’m glad I did. First off, this is not just a straightforward re-release. There are 4 new tracks added to this release, over 28-minutes of new Floorian music (though two tracks from the previous issue have been omitted. The new tracks, however, are some of the best stuff on the album. The album kicks off the same way the first one did with the Porcupine Tree-esque Or So They Say. With its crunching, Middle Eastern inspired guitar riffs and brooding vocals, it sets the mood but only vaguely hints at what’s to come. What follows are the four new tracks to this release. I felt that the original What the Buzzing was reaching out for space but not quite getting there. At least that was my original impression. I’m pleased to say that with these new tracks, Floorian achieve genuine cosmic status as space rockers. Starting with Descend, Todd Fisher’s eerie tremolo e-bow guitar and delay loop guitar, combined with Alex Lee Mason’s wah-wah lead guitar make this track a dizzying, hallucinogenic spacefest. The amazing 8 ½-minute instrumental Aether Spill is full of cosmic synths and eerie percussion (jug, pot, cymbal, shaker, thunder tube), chunky acoustic guitar and a dreamy, melancholic lead. Overruled starts with a haunting, distant voice singing above electronics that might have come from something like Tangerine Dream’s greatest space effort, Zeit, before the slow and buzzing guitars kick in. John Godshalk’s vocals are particularly laidback and tranced out here, adding to the hazy, tripped out nature of the piece, but it really launches into interstellar territory towards the end, becoming almost symphonic as it drifts further and further out into the dark cosmic void. After nearly 17-minutes of space tripping over two tracks, Floorian turns the tables with Waiting For It, a sludgy, buzzing, psychedelic rocker. From there we return to the material from original album, but I’m listening to it now with a bit of a different ear, and I’m catching the cosmic vibe a little more than before. Auravine was one of the newer tracks on the previous version of the album, featuring then newcomer to the band, Larry Durica. With its spaced out chilly vibe and strange thumps and loops, it (now listening to it in retrospect), was a signal from space of the things to come for Floorian. Symptoms Alone, one the best tracks from the original version is a heavy, nearly 10-minute rocker with a bit of a psychedelic stoner vibe to it. Heavium is another slow, guitar-based rocker in the vein of Or So They Say, with an Eastern vibe to both the guitar and percussion. Alt. 11 sounds like a spaced out early Pink Floyd tune but with more aggressive guitars in parts. I love the spine-tingling vocals and acoustic breaks in this one, not to mention the absolutely stunning lead guitar by former band member Phillip Park. Things finish off with the stark, stripped down beauty of Somic, featuring the two founding members of the band, Fisher and Godshalk. Opening with a moaning keyboard that reminded me once again of very early Tangerine Dream, it slips into a gently picked electric guitar with electronics gurgling and bubbling around it. The vocals on Somic are particular ghostly, fitting perfectly with the wistful, otherworldly drift of the song, carrying the listener off into some sleepy, distant cosmic dream. Sometimes revisiting something can cause you to totally re-assess it. Like I said, I did enjoy the original version of What the Buzzing... but wow, even if you already own that one, make sure you get this one. It’s one of the best releases of 2004. For more information you can visit the Floorian web site at: http://www.floorian.com. Visit the Bomp web site at: http://www.bomp.com. CLICK HERE to read the Floorian interview that appeared in AI #23.